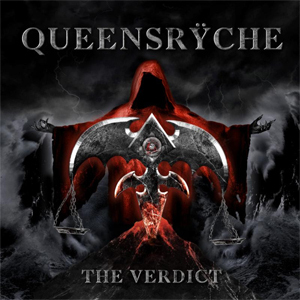 Rock icons QUEENSYRCHE have just announced their newest album The Verdict, out March 1st via Century Media Records. The band's forthcoming release was produced, mixed, and mastered by Zeuss (ROB ZOMBIE, ICED EARTH, HATEBREED) at Uberbeatz in Lynwood, WA, Planet-Z in Wilbraham, MA and Watershed Studio in Seattle, WA. Pre-orders and formats will be announced soon. In the meantime, the band has a Pledge pre-order campaign currently running HERE. "I'm extremely proud of what we were able to accomplish on this record," states QUEENSRYCHE vocalist Todd La Torre about The Verdict. "The relentless dedication and hard work of everyone involved has been very rewarding. I am excited and looking forward to it no longer just belonging to us, but belonging to the world. We hope you all enjoy listening to it as much as we enjoyed making it!" Michael "Whip" Wilton (guitar) adds, "The Verdict is the most metal and the most progressive record we have made in a long time. I couldn't possibly be more excited for everyone to hear this." 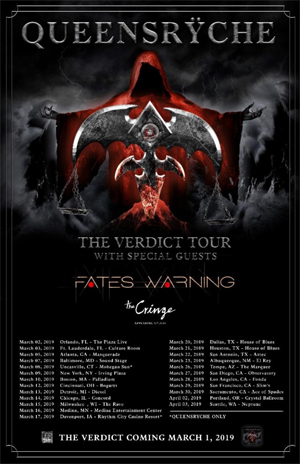 To support The Verdict, QUEENSRYCHE have also announced their spring U.S. headline tour today with special guests FATES WARNING. THE CRINGE will be joining both bands on select dates. The tour will kick off on March 2nd in Orlando, making stops in major markets such as New York, Atlanta, Chicago, and Los Angeles, and will wrap on April 3rd in Seattle. The band recently finished a run supporting SCORPIONS this past September. For more information on upcoming tour dates and to purchase tickets, visit the band's website HERE. The Verdict follows the bands most recent release, Condition Hüman, received rave reviews from outlets such as Loudwire, KNAC.COM, About.com, and more. The 2014 release debuted on Billboard's Top Rock Albums chart at #5 with over 14,000 units sold first week and 100,000 albums sold globally to date. QUEENSRYCHE have secured a triumphant legacy as one of hard rock's most respected and celebrated acts in the industry, selling over 30 million albums around the world across in the span of their 30-plus year career. QUEENSRYCHE's stone cold classic debut full-length, The Warning, and the badass monster sophomore release, Rage for Order, reignited the flames of heavy, progressive, melodic hard rock and metal. The release of the band's third album, Operation: Mindcrime, catapulted the band into mainstream success, single-handedly redefining the concept album and charged into the Top 40. A precision collection of near-perfect songs pushed landmark masterpiece Empire to triple platinum. "Silent Lucidity", off of the fourth LP, earned the band their second and third Grammy nominations, plus five nominations at the MTV Video Music Awards, where QUEENSRYCHE picked up the Viewer's Choice Award. Following the massive success of Empire, the band released Promised Land, which entered the charts at #3 and became another platinum selling record. Adding to their successes, QUEENSRYCHE have dominated Rock Radio with hits like "Jet City Woman", "Another Rainy Night (Without You)", "Real World", "I AM I", "Bridge", and "Sign of the Times". Now, with the band's 16th full-length album on the way, QUEENSRYCHE is looking to continue to dominate the heavy metal scene.